Master criminal Mackie Messer, alias Mack the Knife, marries the savvy Polly Peachum the day he meets her and by doing so angers Polly's father, the "king of the beggars." G.W. 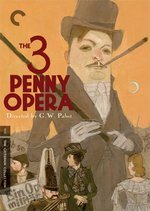 Pabst's film adaptation of Brecht and Weill's smash theatrical hit of the Weimar era sports landmark sound design for the time and some unforgettable performances. The stage musical by Brecht and Weill is very nearly an opera in that someone is singing nearly all the time. The film is a study in the contrast of silence and sound: as the film opens there's (strikingly) no sound until just about two minutes in, as Mackie leaves a whorehouse, spys Polly Peachum with her mother, and follows them to a street performance where a busker is singing about the exploits of none other than Mack the Knife. Critics consider the film to be exemplary in its use of sound. The loss, sadly, is much of Weill's brilliant score. Brecht famously sued the filmmakers over "violation of his artistic intent." He lost the case, whereupon he turned around and said that the lawsuit had been an act of performance art. This may well have been the case: Brecht had substantially rewritten his own play for the screen, adding a sequence about the coronation that wasn't there in the original. There was one creative "winner" in the lawsuit: Kurt Weill, who'd sold himself short on payment for his contribution to the musical, walked away from the lawsuit a wealthy man, as was his due. In many stage productions, Polly sings "Pirate Jenny" for Mackie and his crew as an imitation of a barmaid she says she once knew. In the film, however, a prostitute named Jenny, played by Lotte Lenya, performs the song. "Pirate Jenny" is one of Lenya's signature tunes and the film version does not disappoint. Anyway, maybe it was because I watched this at 2 AM, right after a sweaty hours-long "nap," but the film really felt dreamlike to me. That adjective is seriously misused, of course, but here I mean it literally: I feel like if I described the first hour or so, it would sound like a dream, with its own oblique dream logic. "There was wedding, but it was in a warehouse, and the groom was a criminal so all the attendees were thieves, and then there was a scene where they assigned beggars their afflictions" etc. Finally, I really wish we could put a header image on Fanfare Club pages, because this right here would be perfect. The tone of the stage production was very arch and self-mocking: you pick that up in the film just a little but you're right, Ian, the goings on in the film seem to take place in a dream state. Murnau and Dreyer seem to have been palpable influences on Pabst. At the theatre, I was seated next to a gentleman who'd seen the Broadway production in the fifties, featuring ... Lotte Lenya. P.S. It is well worth it to pick up the Criterion DVD for the commentaries, which are very rich. I wouldn't be surprised if some of the commentaries are also on Hulu: they do that sometimes with the Criterion films. Here's a 45-minute making of documentary that's also on Hulu, presumably from the Criterion edition. True enough. I played in the orchestra for a production one time and it was sui generis. The cast and much of the orchestra was composed of music students at a local college and their enthusiasms and interests steered the show. The guy who played Peachum was an aspiring rapper, so the Lied von der Unzulänglichkeit menschlichen Strebens (Song of the Insufficiency of Human Struggling) was rendered as hip hop. The accordionist in the orchestra was a zydeco fan, so one track which I cannot quite recall -- maybe the Ballade vom angenehmen Leben (Ballad of the Pleasant Life) -- was pure New Orleans raunch. And so it went. A side note, which actually plays against the "no canonical version" idea: the rights holders are apparently very strict about the arrangements of the songs not being changed and require all the instruments listed in the score to be the ones used. I played upright bass in the orchestra, but I was playing parts written for the tuba. A second version of the program (with a print run of one) was created to send to the holding company, so it is possible somewhere in a banker's box in NYC there sits a yellowed program listing me as a tuba player, when in truth I have never even touched the instrument.